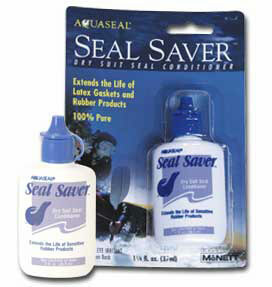 Seal Saver™ protects and conditions dry suit seals, gaskets, O-rings and rubber products. Apply thin coat to inside and outside of seal with cloth or other applicator. Wipe off excess and buff with clean cloth. Avoid contact with adjoining dry suit fabric. CONSUMER MUST COMPLY WITH MANUFACTURER SPECIFICATIONS.